Who was James Branch Cabell? ◊ It's worth noting that this is an image rich site. Most (but not all) of the pictures on this site are shown in thumbnail but are linked to larger versions. Clicking on a linked thumbnail will take you to a higher resolution picture. Clicking again will return. On most browsers, the pictures that are linked to larger versions will show up with a coloured border. Linked pictures aren't otherwise designated, so if you want to see more detail, just try clicking on the picture. It might work. ◊ This site is in a continuous state of development. New sections are planned, and will come on line as they are completed. Our story for April, 2019, is, appropriately enough, "April's Message," which first appeared in Ainslee's Magazine, Vol. XV No. 4, for May, 1905. This story was reprinted in Gallantry, Gal-A1. Click on the cover image below to access this story in its original form. 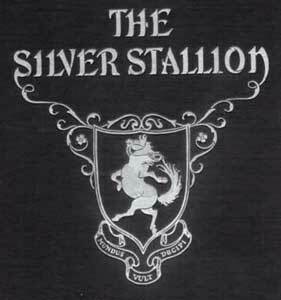 The Silver Stallion is a collaborative effort that depends heavily on the comments and contributions of our readers. We want and need your input. If you have information, photographs, or other data that you'd like to share, or if you have comments, questions or suggestions, please contact us at Webmaster. You are visitor number at this site since 28th November, 2012. Unless otherwise noted all content © 2012-2019 jamesbranchcabell.org. All other © are the property of their respective holders.